EU Foreign Affairs Committee holds special session on the humanitarian rights of IDF soldiers whose bodies are in the hands of Hamas. The European Parliament's Foreign Affairs Committee on Wednesday held a special discussion with the family of an IDF officer, Lieutenant Hadar Goldin, whose body is held by the Hamas terrorist organization in Gaza. The meeting of the Committee on Foreign Affairs of the European Union was held under the title "The Humanitarian Rights of Hadar Goldin". It was initiated by the ECR Party and attended by representatives from all parties in the European Parliament. The meeting was attended by Hadar's mother, Dr. Leah Goldin, his twin brother Tzur and Prof. Irwin Cotler, former Minister of Justice and Attorney Genera;of Canada, who represents the family on issues of international law. 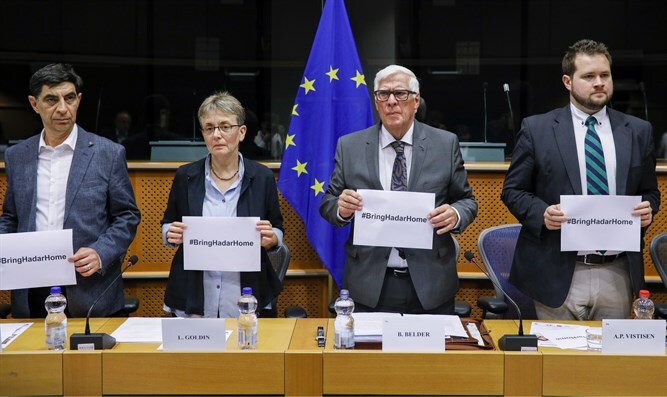 At the end of the discussion, a resolution was adopted that will be adopted by the European Parliament which determined that Hamas and the Palestinian Authority are violating international humanitarian law by holding Hadar in captivity. The decision also states that the return of soldiers and civilians held in Gaza is a humanitarian issue and that the EU must act to achieve a solution. During the discussion, the representatives of Romania, Hungary and the Netherlands demanded that the decision be intensified and that all humanitarian aid to the Gaza Strip be conditioned on the return of the IDF soldiersand Israeli civilians. Dr. Leah Goldin excited the participants when she explained why she had arrived in Brussels: "I am not a state leader, I was not elected by the public to serve in any official position. I'm here because I want to bring my son to be buried, as any mother, anywhere in the world, would do in a similar situation. I'm here because I want to do justice for Hadar." "The EU also agrees that Hadar was kidnapped and murdered in violation of a humanitarian ceasefire initiated by the UN. We came here to ask for your help. The European Parliament is where the humanitarian issues of Gaza are handled. The aid you are sending to Gaza is precisely why you have the ability to act against Hamas. That's the source of our hope," added Goldin. "Our family came here to ask you to be on the right side of history, to enforce humanitarianism against those who deny and ignore it," she said. "We came here to tell you that we are all children of God and we all seek peace - if not during life, at least in death. I ask you that when you discuss Gaza, Hadar's humanitarian rights will be on the table and part of any agreement, and it would be fair to include the return of Hadar as a condition for all humanitarian aid to Gaza." Tzur Goldin, Hadar's twin brother, said, "Let me be clear: We as a family are not interested in stipulating food and medicine for the residents of Gaza. We share the humanitarian distress there because we have bled for it every day for the last four years. Hamas holds the body of my brother, humiliating and destroying it in any barbaric way that exists and uses it as a political tool and as a means of propaganda." "For four years we have been witness to generosity and unilateral progress regarding the situation in Gaza, including steps from the organization we are in now. But it is not fair that there has been almost no initiative regarding the solution to the return of my brother and the other Israeli prisoners from Gaza, no initiative from this place that calls itself the 'gatekeeper of humanitarian rights in the world,'" said Tsur Goldin. Hadar Goldin was killed when his unit was attacked during a UN-brokered ceasefire during Operation Protective Edge in 2014. His body, as well as the body of IDF soldier Oron Shaul, has been held by Hamas for nearly four years.